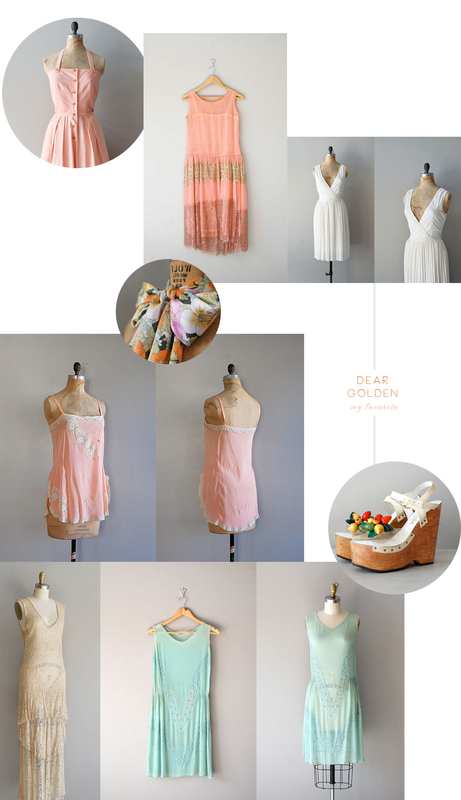 My favorite places to shop online for vintage is Dear Golden. Hands down. Each pieces makes me want to drive straight up to Michigan and try on all the beautiful wears. The dresses, blouses and shoes are in great condition and most very wearable, not so much for this gypsy eye-candy. There's so much to love about vintage clothing. Dresses that show off your waist, flirty lace details, the perfection of color palettes and so lady-like. I've been collecting some vintage dresses, shoes, bags and accessories for an extension to the 6 petals shop. This weekend I'll be photographing that collection. There's still some work to be done before the debut, but it's gonna be cool. Promise.